[the]Collective is a group of unique talents who can offer what no other group in Asia can - International appeal. Hailing from all over the world, with work that stretches across it, this prodigeous group of independent individuals have united under a common banner to stand for quality of work, as well as independence from the system. 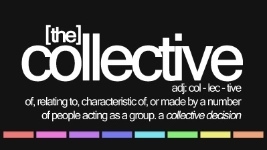 [the]Collective is a brand of quality, a message that there IS another way... and a group of talent that is greater than the sum of it's parts. Have a look around - make yourself at home... and enjoy the ride! Anthony Morse hosts "The New Silk Road"
MTV VJ Alan Wong Wraps Season 3 of MTV Show! MTV Asia just wrapped Season 3 of the MTV Show - and [the]Collective member and MTV VJ Alan Wong and his co-host Hanli bring you up to speed about what they like about working together on the show. TEN Season 2 to start Sept 26 on AXN!! Member Jason Godfrey shows us why the Philippines is the perfect \"10\" for travel, food and fun!